PlaceholderAPI is a plugin/library that allows servers the use of placeholders from a wide range of your favorite plugins collectively. 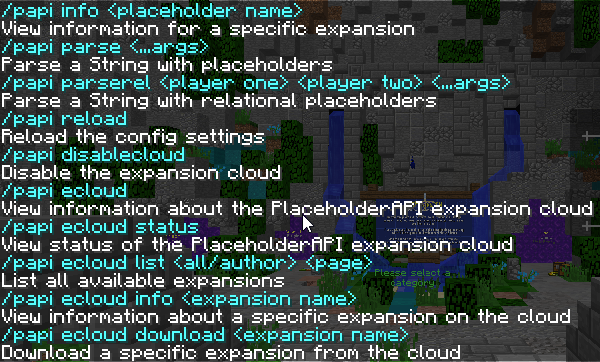 Essentials, Factions, LuckPerms, Vault, AutoSell, GriefPrevention, etc.... You can display information from your favorite plugins in any plugin that supports PlaceholderAPI. See a full list of placeholders and supported plugins below. Through the use of the Expansion cloud, PAPI effectively and efficiently allows you to pick and choose which placeholders you want to install. The Expansion cloud allows you to receive new placeholders, updates to existing placeholder expansions, and much more directly from your server without updating the actual plugin. With over 100,000 downloads, PlaceholderAPI is a must have for a server of any type or scale. The config.yml contains the core plugin customization settings as well as a section specifically for expansions that wish to add configurable options too. Any settings an expansion may allow you to change will be added to the config.yml when that specific expansion is loaded. # These placeholders will be parsed to the correct values before the expression is evaluated. # DO NOT USE THESE VARIABLES UNLESS YOU KNOW WHAT YOU ARE DOING! # the player class for the specified player. # More advanced variables are coming soon! Only use these variables if you know what you are doing! # if the folder/file exists. If the folder/file does not exist it will be created. # You must specify the file extension with the file name. Any file extension is accepted. expression: '"%vault_group%" == "Moderator" || "%vault_group%" == "Admin" || "%vault_group%"
please be kind enough to leave a like and review! Amanso25, Diclo, Mr_lonely132 and 68 others like this. %server_tps% doesn't seem to work like it should :/ this was one of the biggest reasons I got this plugin. I love this plugin so much that I am leaving this review to tell the dev that I love this plugin and to keep supporting it for as long as he can. Keep up the good work! What an amazing and helpful plugin. It's brought so many great additions to my server. Definitely a must-have essential!